Please join us for a premiere Genetic Genealogy event, held in San Diego next month. The DNA Detectives brings back the Institute for Genetic Genealogy Conference (I4GG) for 2016, this time in San Diego, CA on October 22 and 23, with 14 experts presenting 21 genetic genealogy topics. The presentations will cover all levels of experience, beginner, intermediate and advanced. Headlining the conference are leading genetic genealogy educators Blaine Bettinger and CeCe Moore (me), with special guest Schelly Talalay Dardashti of Tracing the Tribe. 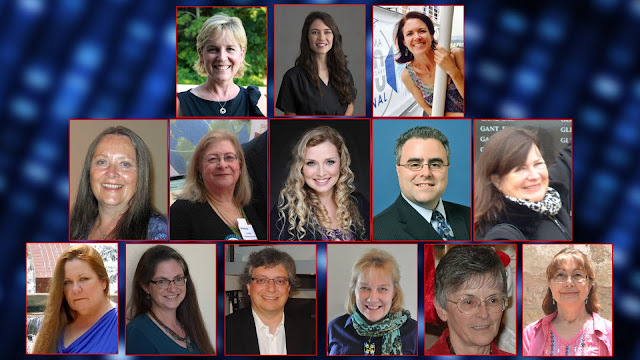 We are honored to be able to present the following additional speakers with expertise in a wide variety of areas in genetic genealogy: Carol Rolnick, Michelle Trostler, Kitty Cooper, Kathy Johnston, Leah Larkin, Barbara Rae Venter from DNAAdoption and Junel Davidsen, Kathleen Fernandes, Thomas Krahn from YSEQ, Afton Vechery from 23andMe and Janine Cloud from Family Tree DNA. This event will cover traditional genetic genealogy as well as genetic genealogy methodologies for unknown parentage, with two tracks to choose from each day. Attendees can choose from one of two presentations (in either track), running all day Saturday and Sunday. The tracks on Saturday will focus on 1) Traditional applications for Genetic Genealogy research and 2) Using DNA for unknown parentage/adoption search. Sunday will start out with an exciting keynote given by Blaine about the future of genetic genealogy. During the two tracks on Sunday experts will cover third party tools, endogamy, Jewish DNA, spreadsheets and triangulation, case studies and you will hear from two of the leading companies in the field. We are very excited that Blaine will be presenting two brand new talks at this conference, Evaluating a Genealogical Conclusion Including DNA and DNA and the Aftermath of Uncovered Family Secrets. His wonderful new book "Family Tree Guide to DNA Testing and Genetic Genealogy" will be available for purchase on site. Both Family Tree DNA and MyHeritage will have an onsite presence at the event. Early registration has been extended until the end of the month (since I hadn't had time to blog about it until now). The cost is $169 for both days or $99 for one (videos will be included with the full two-day conference registration). There is still availability in our room block ($145 + tax until Oct. 4, subject to continued availability) at the Sheraton Mission Valley. Please go to http://i4gg.org/event-information/ to learn more and to register. Watch our awesome video below and at https://vimeo.com/181412550. GENETIC GENEALOGY CONFERENCE i4gg 2016 SAN DIEGO OCT. 22 &23 from The DNA Detectives on Vimeo. Videos of the event will be offered for sale at a future date. 23andMe has just released a new option for customers in the U.S., offering the ancestry features of the test for only $99. This means that the health results will not be included with this product, but the portions of the test that are important to most in the genetic genealogy community will be - Ancestry Composition admixture percentages, DNA Relatives matching and the haplogroup assignments, plus the raw data. Customers will have an opportunity to upgrade to include the health portion later for $125, if desired. The same chip is used and all new testers will be compared against the existing database, so this is not a separate product. If you have been waiting to test at 23andMe, now is the time. Order here. This is the first commercial that specifically talks about relative matching instead of just ancestral origins. I think that is really exciting! Mountain View, Calif. – September 21, 2016 – 23andMe, the leading personal genetics company, is now offering its genetic ancestry service as a standalone product for $99. The service features 23andMe’s pioneering Ancestry Composition analysis, enabling customers to trace their lineage to 31 populations worldwide through their DNA. The service also includes DNA Relatives, an optional tool matching willing customers with close or distant relatives based on shared DNA. Customers purchasing the new ancestry service have the option to upgrade to 23andMe’s flagship health and ancestry product which includes an additional 60+ genetic reports on carrier status, wellness and physical traits. The $99 genetic ancestry service analyzes genetic variants across all chromosomes to provide a breakdown of global ancestry by percentages. The average customer can trace their DNA to at least 5 different populations from around the world. Customers will also have their 23 pairs of chromosomes “painted” — a color-coded digital sketch unraveling your DNA, detailing the amount, or length, of specific ancestry on each chromosome. Additionally, customers will have access to 23andMe’s DNA Relatives tool, allowing them to share and compare their DNA to that of other 23andMe customers, if they opt-in to do so. Ninety-five percent of 23andMe customers participating in DNA Relatives connect with a third degree cousin or closer relative. And for customers interested in ancient ancestors, our Neanderthal report tells people how much Neanderthal DNA they have. Customers who purchase the ancestry product have the option to upgrade to 23andMe’s full health and ancestry service for an additional $125. The company is also launching a new national television ad showcasing the ancestry experience. The $99 ancestry service is only available at www.23andMe.com. 23andMe, Inc. is the leading personal genetics company. Founded in 2006, the mission of the company is to help people access, understand and benefit from the human genome. 23andMe has more than one million customers worldwide, with over 80 percent consented to participate in research. 23andMe, Inc. is located in Mountain View, CA. More information is available at www.23andMe.com.